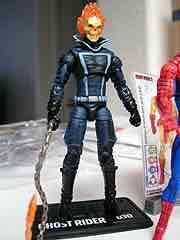 Why is this Ghost Rider figure so special? It not only looks totally awesome, but it has an exceptional amount of articulation. (I count 21 joints.) Without resorting to cheating by adding additional arms or something, this figure may be the most articulated 4 1/2-inch figure out of Hasbro. Hasbro added additional hip joints, meaning the figure is actually incredibly capable of sitting on a motorcycle or assuming additional poses. How does Hasbro pull it off, you ask? Well, these toymaking geniuses added to the hips and waist. The figure has a joint at the belt as well as at mid-torso, plus there are two joints at the hip-- one where the leg meets the body, and another swivel joint right below the hip. The legs can also sit at a 90-degree angle, which is quite uncommon on this line so far. Since Hasbro's Marvel Universe line is more expensive than its other 3 3/4-inch lines, it's nice to see more detail on the figures since they are usually devoid of accessories. 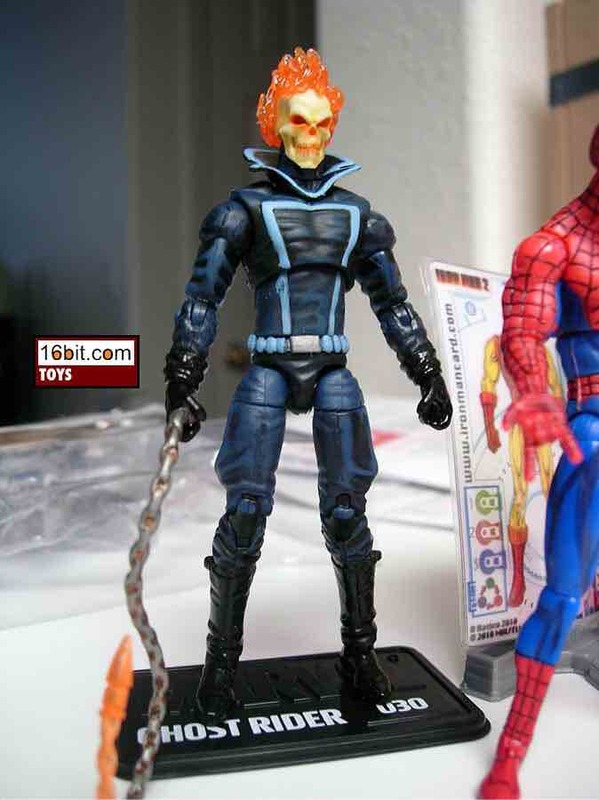 In the case of Ghost Rider he has a chain he can flail around, but really, it's not a motorcycle so it isn't very interesting. The figure is cast in black plastic with lots of blue detailing, which makes it look like it fell out of a comic book from the 1970s and not a realistic action figure. This is, of course, how it should be. What could possibly make this figure better? A motorcycle, or a glow-in-the-dark feature. If you look at the color of plastic used for the skull, it really looks like it should glow. It doesn't. I am therefore sad. Maybe we'll see that sort of thing some day, but for now? This is a fine figure to keep around on your desk, plus it's a flaming death skull head. Halloween is almost here, and I can't think of a better figure to keep around because flaming death skull head.